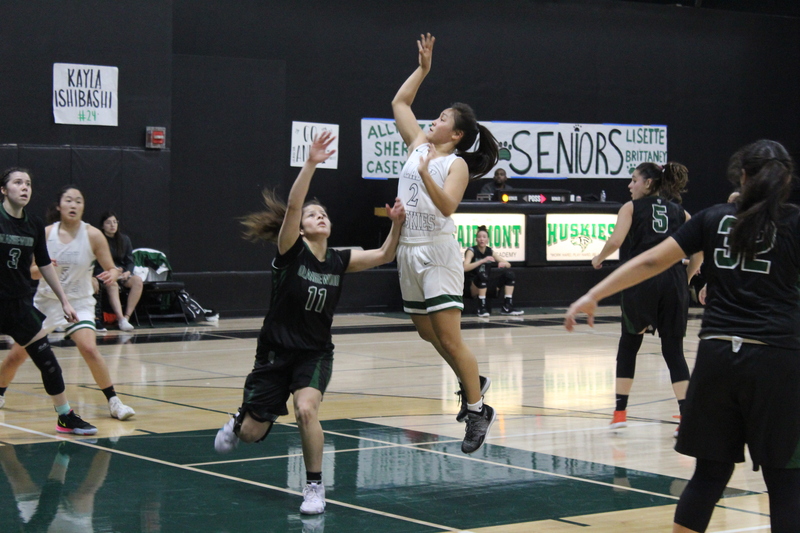 ALLY YAMADA (23) of Fairmont Prep of Anaheim leaps above Paulina Quintana of Orangewood Academy of Garden Grove in San Joaquin League action Wednesday night. Fairmont won 54-43 (Tribune photos by Christopher Abdelmalek). As the regular season draws to an end, most teams are jockeying for a playoff berthand a favorable seeding. A single loss can bump you from the playoffs, change you seeding, or force a team to go on the road to start the playoffs. But when the two top teams in the San Joaquin League faceoff in the last game of season with a chance to take the league title, all bets are off and the game is on. The Orangewood Academy (of Garden Grove) Spartans (14-13 overall) faced off against the Huskies of Fairmont Prep (13-13)on Wednesday night at Fairmont’s gym in Anaheim. The Huskies came into this game with a perfect 7-0 record in league play this year, while the Spartans had 6-1 record with their sole loss coming at the paws of the Huskies. Well much like Tom Brady making back to the Super Bowl, history repeated itself Wednesday as Fairmont defeated Orangewood 54-43. CLARA WITGEN (5) of Orangewood sets up to shoot as Fairmont’s Anling Su Vera (23) moves in to defend. The game started off slow as both teams felt each other out. The Spartans tried pushing the tempo to no avail. Then the Huskies began to run full court sprints on offense and defense and really speed things up. But the game was close up till halftime with the Spartans only trailing by one point. “We tried to make adjustments at halftime,”said Coach David Esparza of Fairmont. The team listened to the adjustments that were made. The Huskies pulled away to a 10-point cushion in the third quarter,playing lights-out defense and only allowing six points in the quarter. That deficit was too much to overcome for the Spartans and they fell in this one. Tarryn Ross led the way for the Spartans with a game high 17 in the losing effort. She was assisted by Isabella Robles, who chipped in with 11 points. 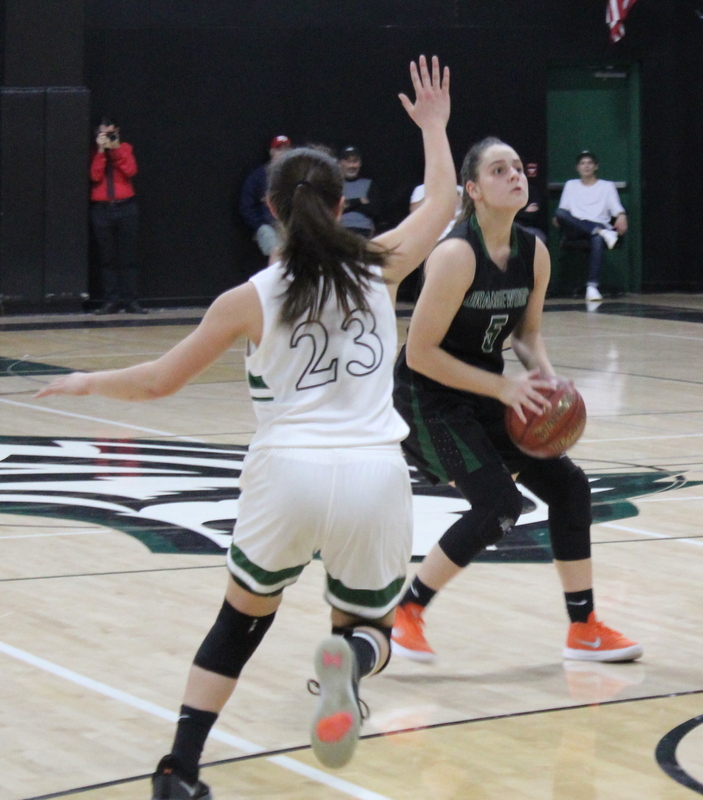 Offensively the Huskies were well balanced, having three different players score in double figures and seven players overall scoring for the team. Izzy Om lead the team with 11 points and Sheridan Glover and Anling Su Vera both dropped in 10 points for the Huskies. As the Huskies finish off their league play with a perfect 8-0 record, they now await the news as to who their next opponent will be as they look forward to the second season.